At Atrium Dental Implants, our commitment is to treat your periodontal and dental implant needs in a professional, timely and comfortable manner. 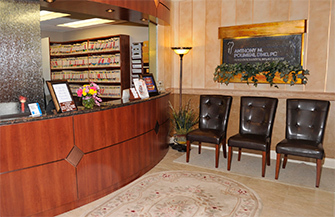 Dr. Anthony M. Polimeni and our staff believe that treatment is a two-way street of communication. Our goal is to treat you and educate you at the same time. We always welcome and encourage your questions and comments. Your satisfaction is our ultimate objective, and we welcome the opportunity to provide you with the highest standard of up-to-date care possible. Our philosophy is simple. We are committed to preserving the health, function and appearance of your natural dentition through high-quality, state-of-the-art periodontal and dental implant therapy. In order to achieve this goal, we encourage a team approach between you, your family dentist and our office. You and your dentist will be advised and informed fully as to all treatment plans and objectives. Dental Implant Surgery. Dr. Polimeni has extensive university-based advanced training in surgical placement of dental implants and the intricate bone grafting procedures that are sometimes required to successfully place implants. We have advanced computer-assisted treatment planning capabilities in our office, which enables us to format and evaluate our patients CT scans for precise implant placement. Non-Surgical and Surgical Treatment of Gum Diseases. Our office offers an array of both non-surgical and surgical treatment of gum diseases. Dr. Polimeni uses surgical telescopic lenses, which enable him to use smaller, less invasive surgical incisions. This leads to much easier post operative recovery and faster healing. This practice is considered to be the most hi-tech and cosmetic oriented periodontal and dental implant practice in the Huntington area. Contact our Huntington, NY dental office today to schedule an appointment! 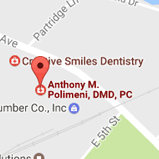 Providing quality dental care to Huntington, Dix Hills, Halesite and Lloyd Harbor and all surrounding New York areas.